1. If you use dried beans, soak them overnight. Cook them with enough fresh water until tender. Drain and reserve. 2. Heat the oil in a large saucepan over high heat. Add onions and garlic, cook for 2 minutes. 3. Add celery, carrots, bay leaf, parsley and cook until tender, for 7 minutes, over medium-low heat. 4. Add tomato paste, stirring frequently. 5. Add sage and prosciutto. Season with salt, black pepper, red pepper, and continue cooking for 5 minutes, over medium-low heat. 6. Add 2 cups of the beans and 2 cups of chicken broth, bring to a boil. 7. In a blender, process the remaining cup of beans, with the cup of chicken broth. 9. Add them to the saucepan and continue cooking over medium-low heat, for 15 minutes. Taste the salt and pepper. Turn off the heat. 10. 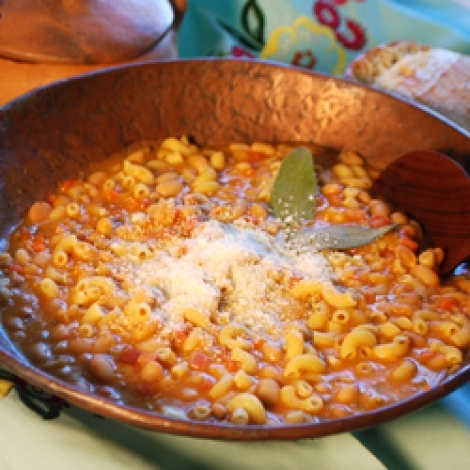 Bring a medium saucepan of salted water to a boil, add the pasta and cook “al dente”, drain and add to the saucepan beans. 11. Add the Parmesan cheese and a dash of olive oil. Mix thoroughly. 12. Let them rest. Serve.